Click on images or on the links below images to enlarge. List of course units. The picture is your fearless instructor superimposed on a modern graphic of Hannibal. 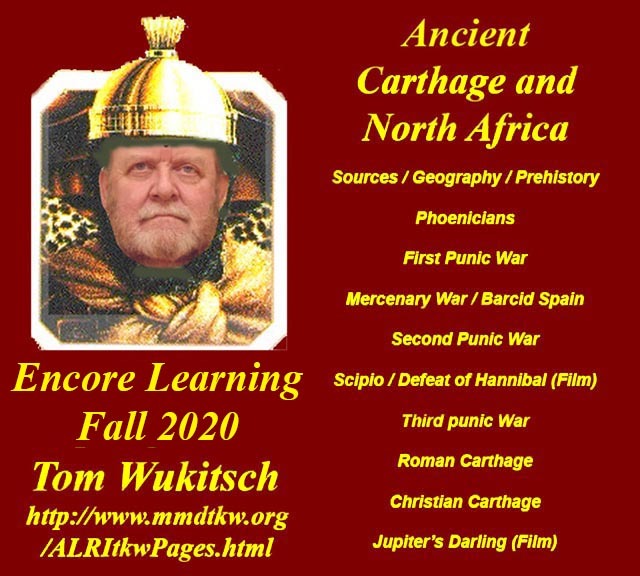 This is a multidiscipline course covering many aspects of the Carthage/North Africa area, starting at about 6 to 8 thousand BC and continuing through the the Carthaginian Empire, Roman Carthage, and Christian Carthage. 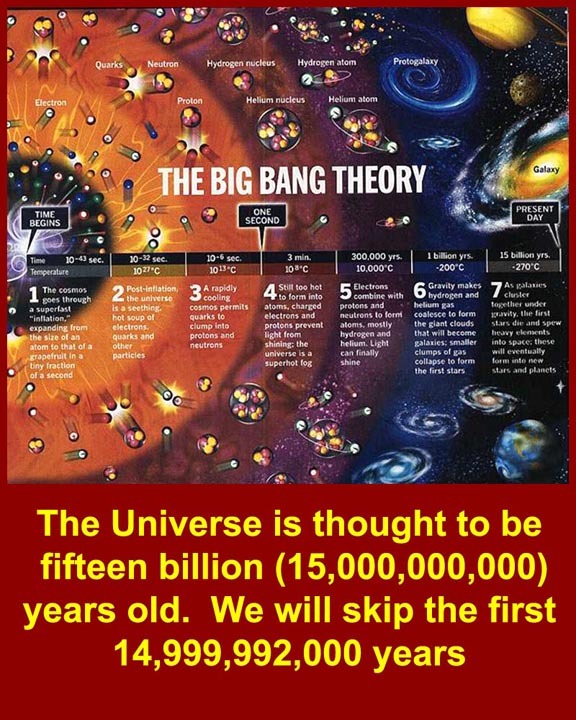 Time started with the Big Bang, about 14 billion years ago. 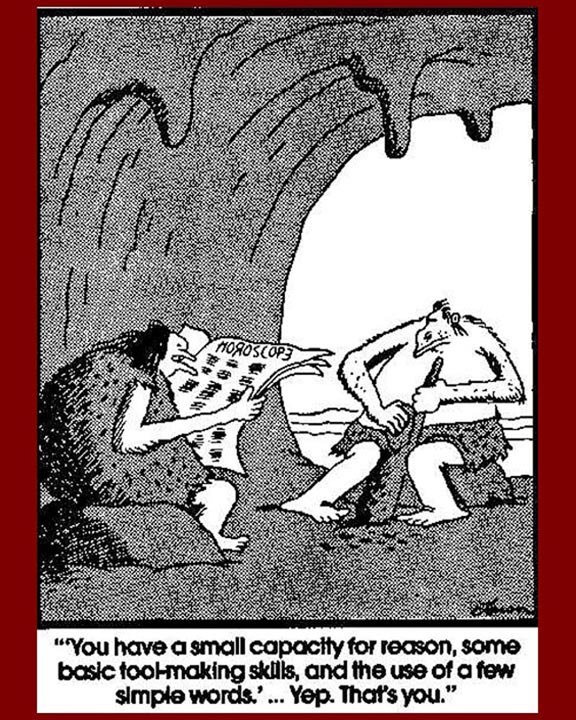 We will skip the first 13,999,992,000 years or so, and start with the North African stone ages. The Phoenicians competed with the Greek city-states for coastal inlets where "factories" could be established for trade with the interior. The sites they chose were as close to one day's rowing in a trade vessel as possible. Most sites were established early on when the Greeks and Phoenicians were coastal navigators rather than open sea sailors. Some of the sites eventually acquired agricultural hinterland, and one, Carthage, acquired a merchant empire. 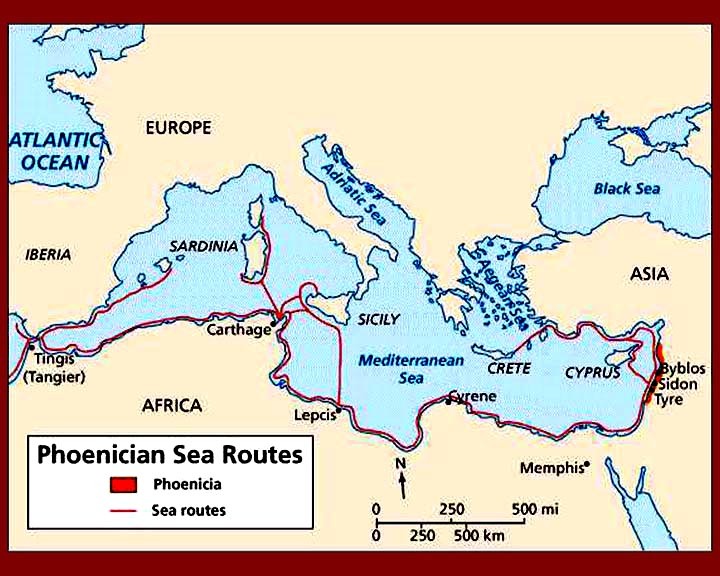 Phoenician sea trade routes stretched from Gibraltar (called "the pillars" by ancient Mediterranean sailors) to the eastern edge of the Mediterranean and into the Black Sea. When the seat of Phoenician activity transferred to Carthage, trade was extended down the Atlantic coast of Africa and up the Atlantic coast of Europe at least to modern Portugal and perhaps as far north as England. A NASA view of Carthage and Sicily. Greek colonies were on the Western side of Sicily and along the southwest coast of peninsular Italy. Carthage eventually controlled the western end of Sicily as well as Sardinia and Corsica and made occasional raids the Italian western coast. 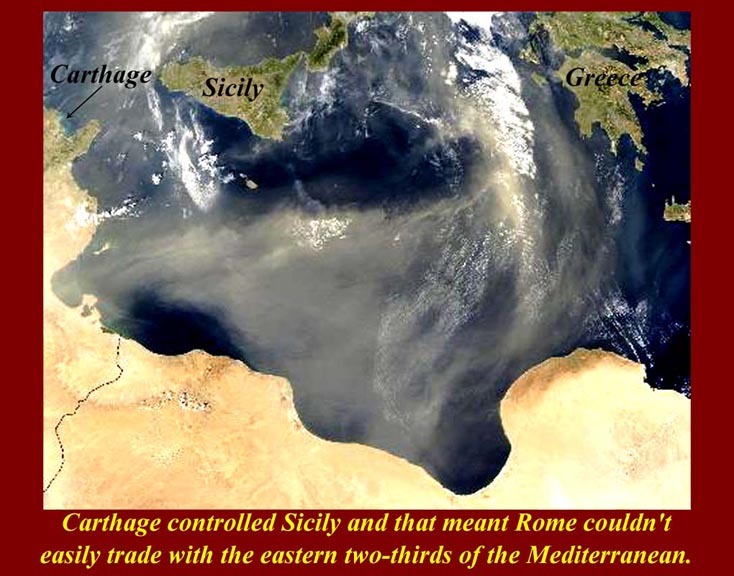 Carthaginian fleets had control of the seas and thus preempted Roman trade with the eastern Mediterranean. The distance between western Sicily and Cap Bon Peninsula on the Carthaginian-controlled coastline of northern Africa is 140 kilometers (87 miles). A composite map from NASA shows the Tell Atlas and High Atlas mountain ranges of northern Tunisia. The long trough between the mountain ranges is the valley of the Medjerda River, which rises in Algeria (left) and flows into the sea at the bay of Tunis. 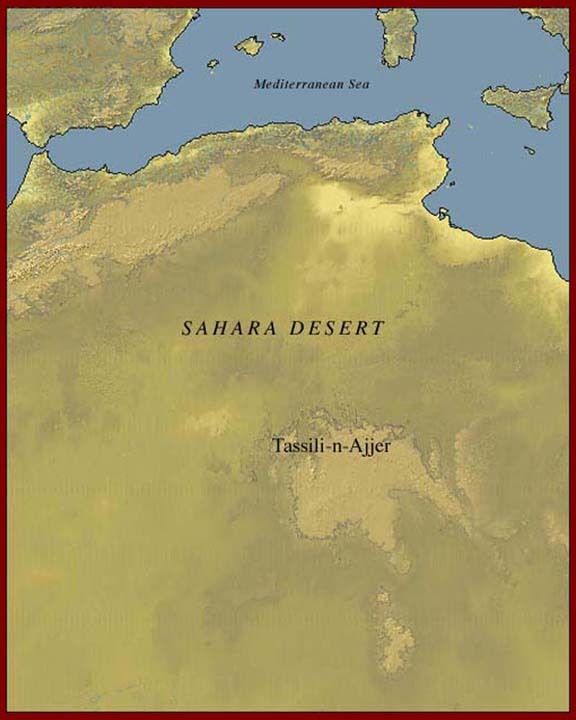 The next image is a map that shows the various terrains of modern Tunisia and the names of the ancient towns and cities. 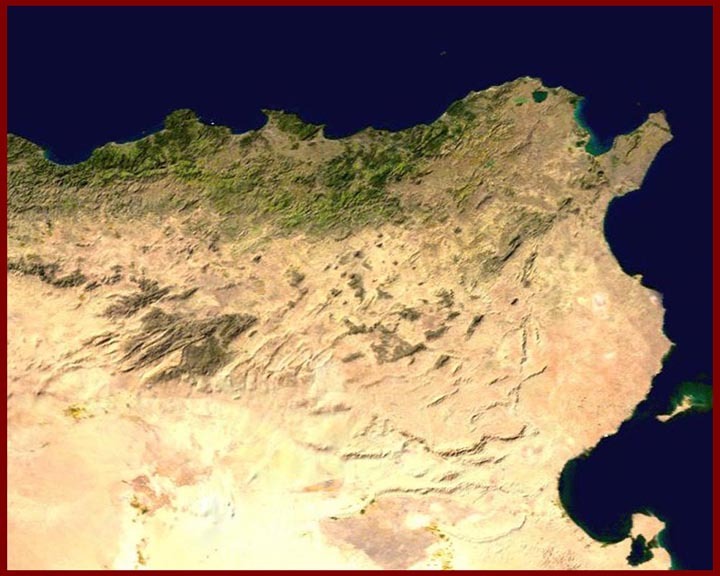 The beginning of a short Geography lesson: The Bay of Tunis is defined by the Cap Bon Peninsula and the Northeast corner of the Tunisian land mass. The towns on the Bay are Utica, Carthage, Rades, and the modern city of Tunis. Kelibia and Nabeul are in the east side of the Cap Bon Peninsula. There are two mountain peaks on the Peninsula called Qarneyn (meaning "the two horns"), and it was from those two peaks that coded fire signals were passed to the Carthaginian colonies on Sicily. In ancient times, Utica, the main Punic rival of Carthage, was right at the mouth of the Medjerda River, but the centuries have added more delta land to the coast, and Utica is now more than a mile inland. Two historic battles were fought at Utica: in the first, Carthaginian General Hamilcar Barca, the father of Hannibal, defeated Utica and former Carthaginian Mercenaries in the "Mercenary War" that Carthage fought between the First and Second Punic Wars (the "Mercenary war" is covered in Unit 4); in the second battle, forces loyal to Julius Caesar defeated an army of Pompey's allies in the Roman Civil war the resulted from Caesar "casting his die" by crossing the Rubicon. Each battle was called the "Battle of the Bagradas River", that being the ancient name of the Medjerda River. South of the two mountain ranges is the coastal plain called the Sahel (which curiously enough means "coastal plain". It is and always has been low, flat, hot, and, where there is rain, fertile. Further inland and to the southwest of the Sahel is the area of the Chotts or depressions (it's pronounced like "shots"). These are seasonally flooded areas that are even lower than the Sahel. There is much salt from occasional sea flooding. 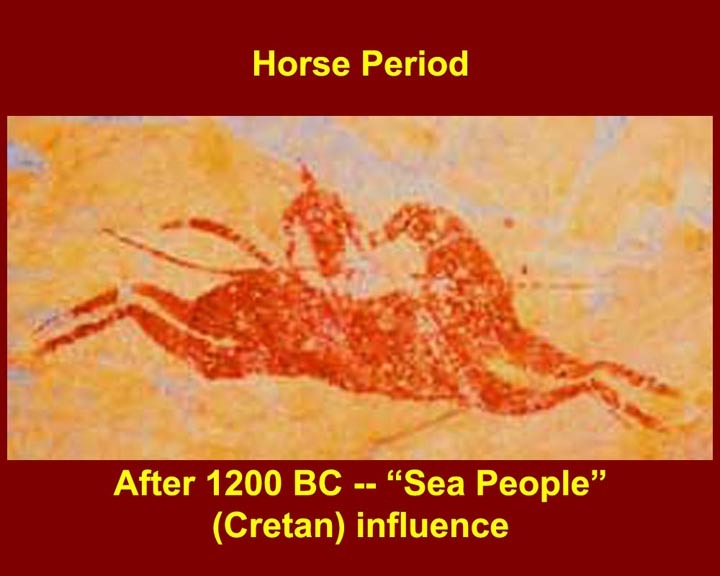 During the ice ages (the last of which ended only 10,000) years ago, the sea level was much lower, and this area and the Sahara dessert south of the Chotts was fertile and verdant -- the home of prehistoric Neanderthals and early modern man (Cro Magnons). See below. A small valley among the Atlas Mountains. 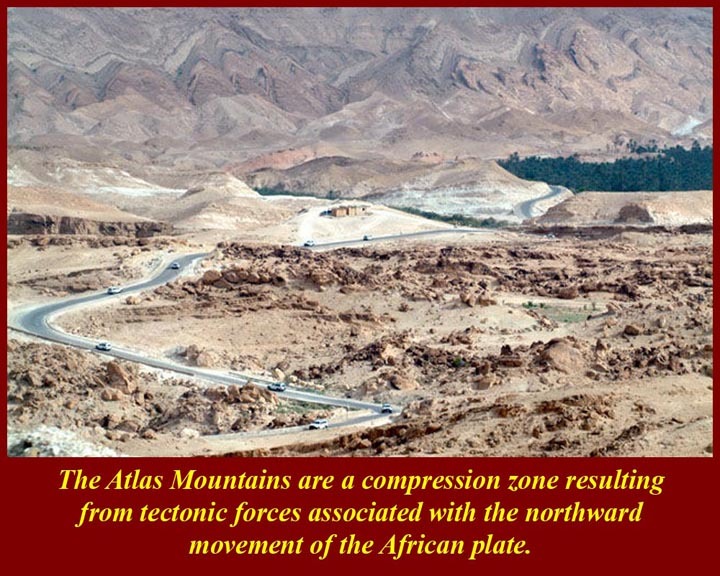 The several Atlas mountain ranges of north Africa are all parts of of a compression zone cause by the impingement of the African plate on the European plates. (The Alps are also compression mountains caused by the same movement.) Unlike in Italy, there appears to be no subduction, so there is no volcanic activity in North Africa (or in the Alps, for that matter. The Atlas Mountains have always been the haven of the "Berbers" (what foreigners call the Amazigh peoples). Tunisian Amazigh usually identify themselves as Arab Tunisians, unlike the Moroccan and Algerian Amazigh, who try to preserve a separate cultural identity. The Amazigh are considered to be descendants of the native peoples of North Africa, i.e., pre-Greek, pre-Carthaginian, pre-Roman (and Christian Roman), pre-Vandal, and pre-Arab. The Fertile Medjerda Valley, between the High Atlas and the Tell Atlas in Tunisia. 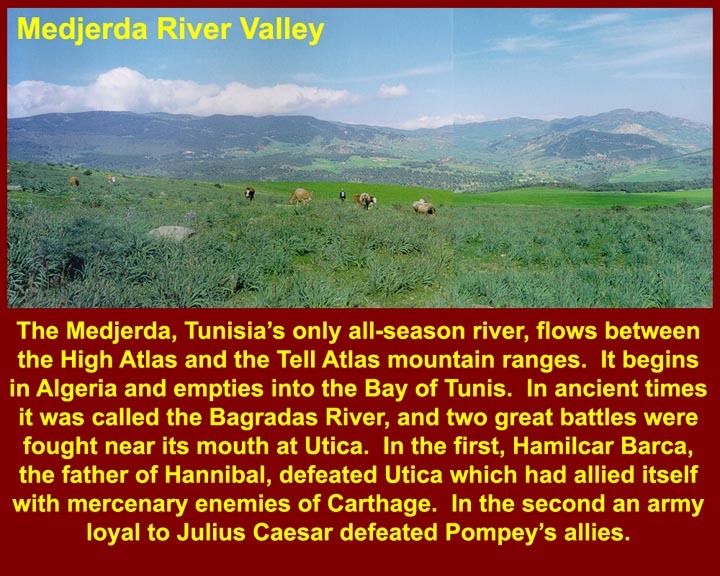 The Medjerda Valley is the breadbasket of Tunisia, and in ancient times it was the same for Carthage. Suosse is a coastal city in the Sahel. The central part of the city, at the back of the harbor, is the site of Punic Hadrumete. The town had several other names in later periods before becoming Soussa or Sousse in Arabic. 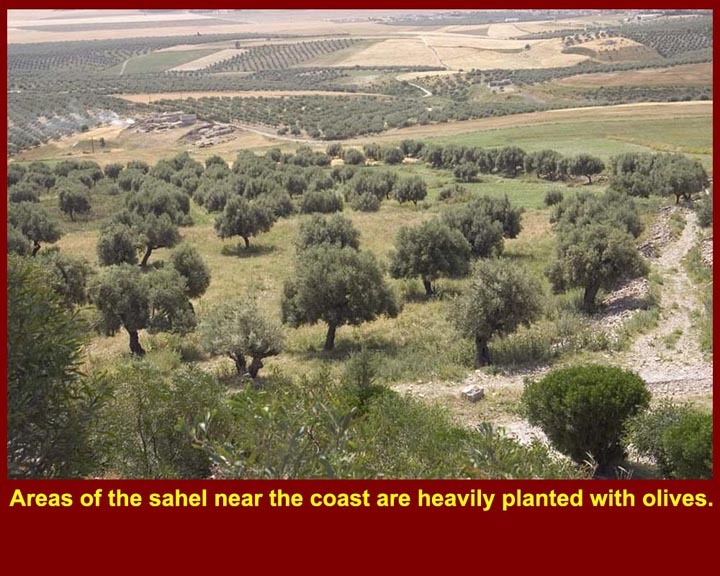 The watered parts of the Sahel are heavily planted in olives. 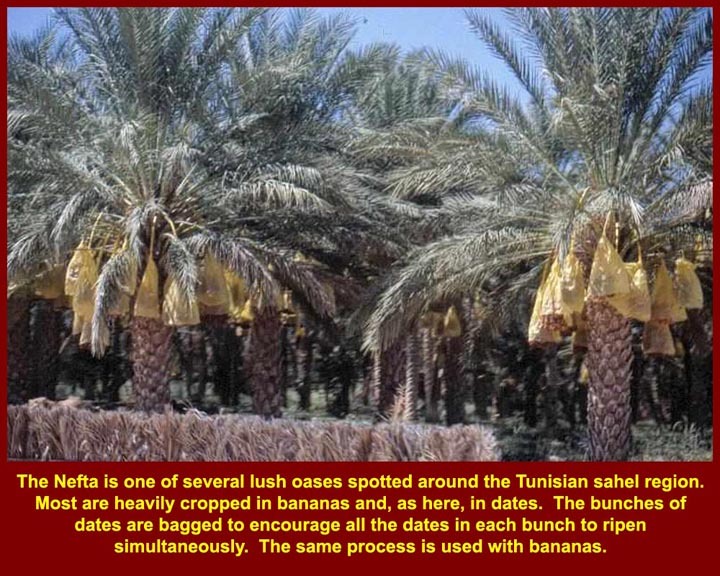 Inland Oases in the Sahel grow dates and, more recently, bananas for the European market. 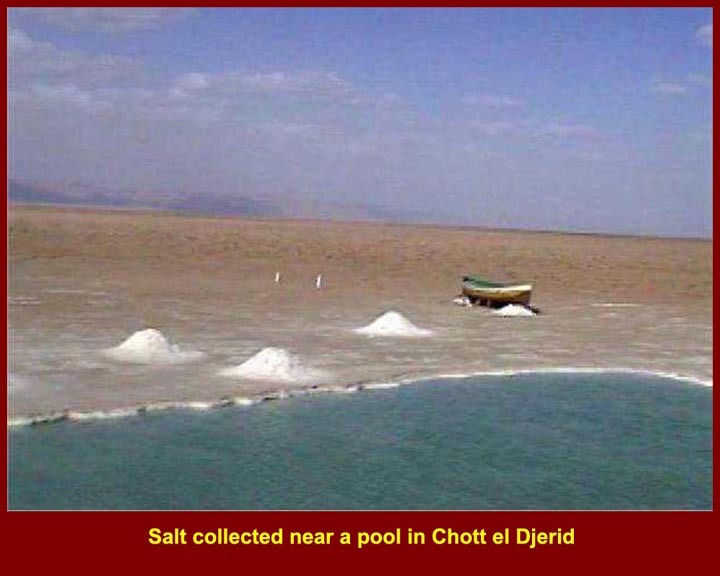 Chott el-Jerid is the largest of the Chotts. 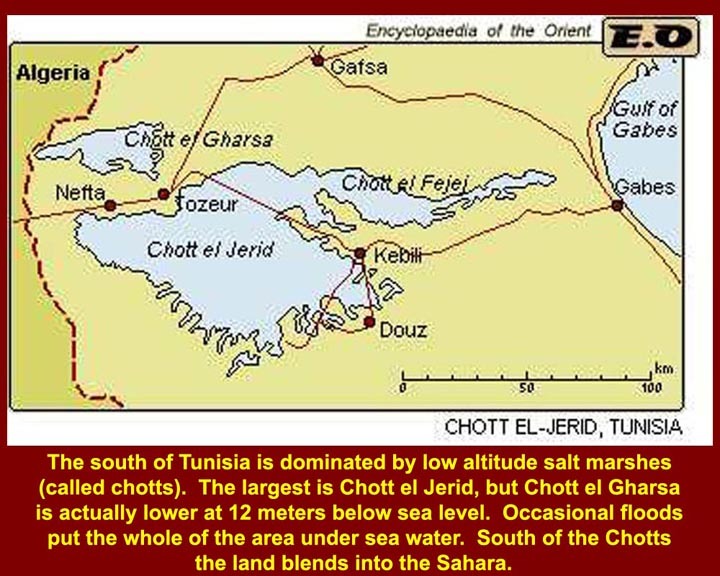 To its northwest is Chott el-Gharsa, which at 12 meters below sea level is the lowest point in Tunisia. The Chotts are salty enough to be mined. There are occasional folks who try to drive through the Chotts. This one did it on a motorcycle. 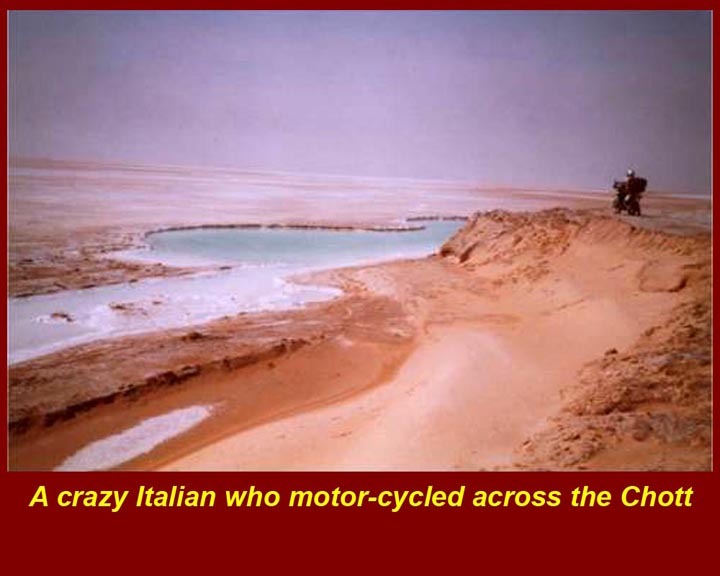 In recent years the Chott el-Jerid Desert Rally has drawn teams of off-road vehicles. Even the Sahara has become a tourist attraction. Tunisia's main industry is Tourism. Prehistoric North Africa. 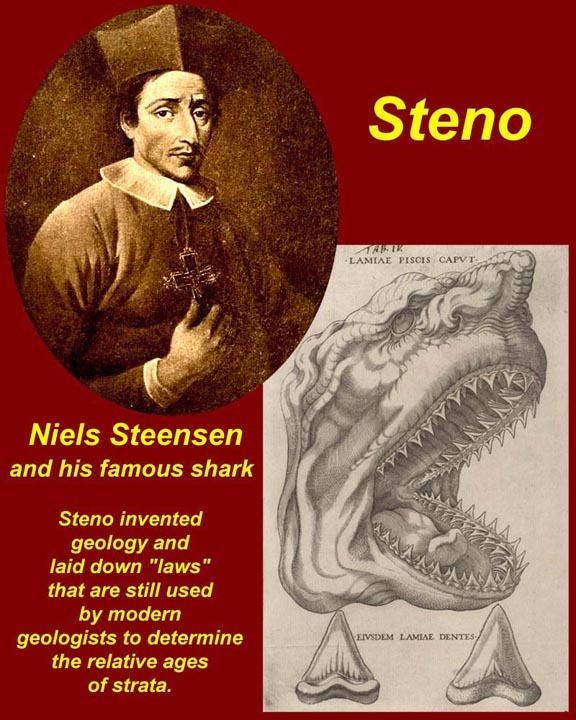 Niels Steensen (Later Latinized to Nicholas Stenonis = "Steno") was a Dane who, after going to Rome, worked out the basic rules of geology. 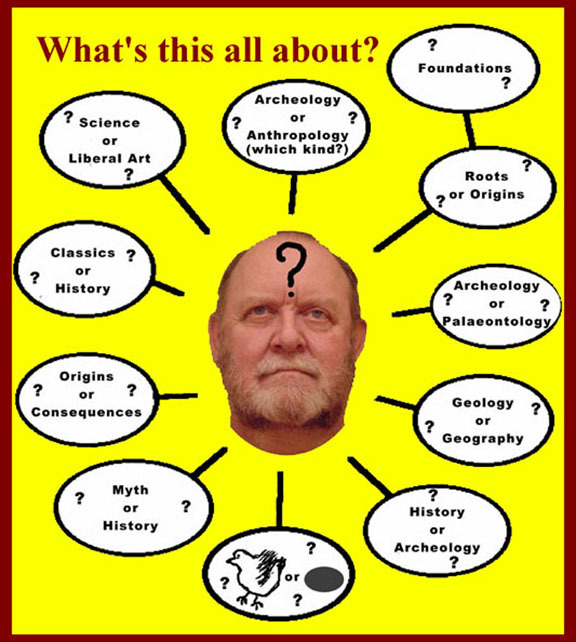 His "principles" included: horizontal deposition of strata; inclusions (fossils and artifacts) existed independently before being surrounded by the matter of the strata -- they didn't grow inside the stone layers; lower strata existed before higher strata (unless they had obviously been inverted. Without Steno there would be no geology or palaeontology. 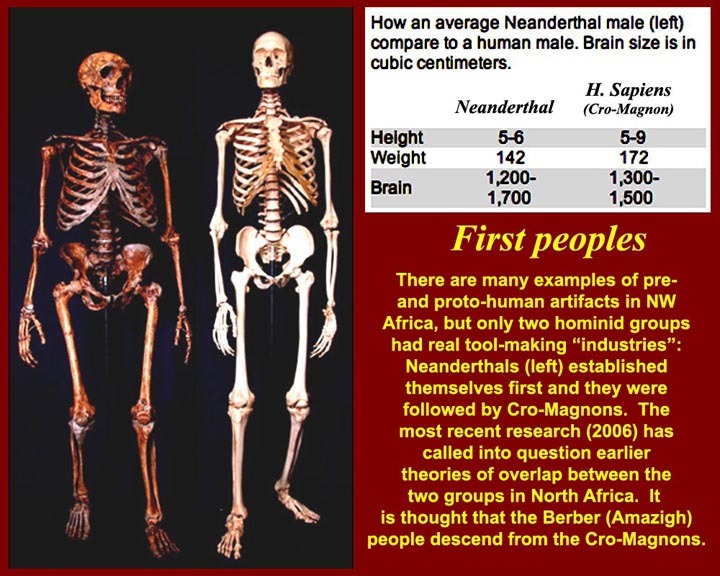 The Neanderthal skull, on the left show several signs of "primitive" development: (1) pronounced eyebrow ridges, (2) back-sloping frontal eminence (forehead), (3) more robust zygomatic (cheek) bones, (4) a much more robust mandible, (5) receding chin line, (6) cranial base that tilt the head backward (relative to H. Sapiens Sapiens), and several other minor differences from the current H. Sapiens Sapiens. It does not, however, have the fore-and-aft saggital crest of more primitive anthropoids: Neanderthal jaw muscles were attached to the side of the head like ours rather than along a central crest. The face of the Neanderthal was larger than H. Sapiens Sapiens, but it's worth noting that the H. Sapiens Sapiens face has been shrinking fairly constantly for thousands of years, and noticeably even in the last three hundred years. The shrinking seems to be associated with a softer diet which requires less chewing. 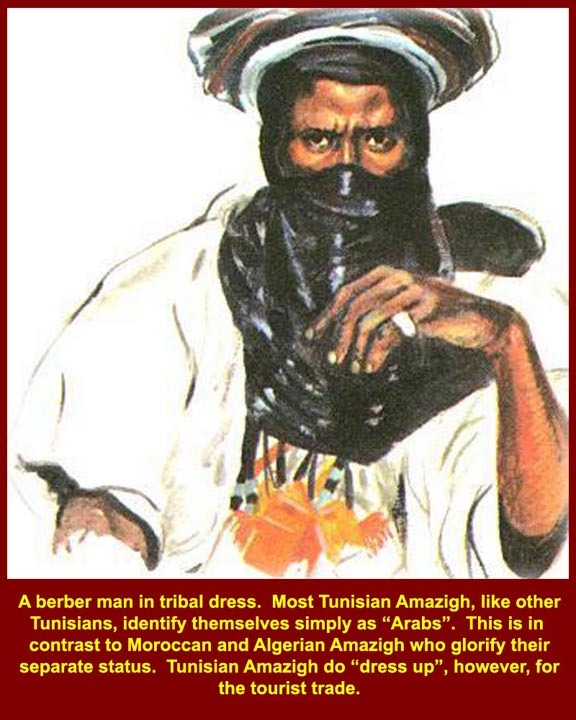 Amazigh in Tunisia seldom wear "Berber dress". The Amazigh, as mentioned above, are considered to be an aboriginal population in North Africa. The first "foreign" (i.e., continental European) arrivals were the Greeks who called this native population Libyans -- the western script spelling is hotly debated in a completely nonsensical way: all spelling are equally valid since they are all just transliterations from the Greek alphabet. 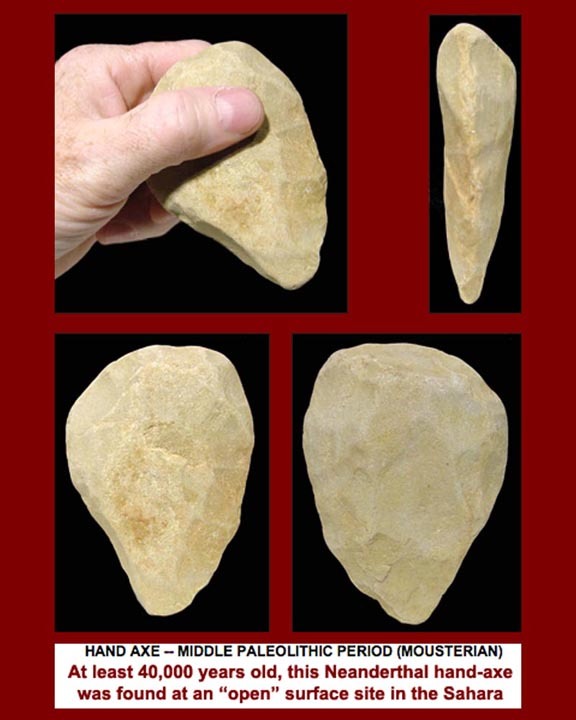 A North African Saharan "Mousterian Industry" hand axe -- one of the "industries" of the Neanderthals. Neanderthal artifacts and remains in Northern Africa are earlier than about 35 to 40 thousand years ago. 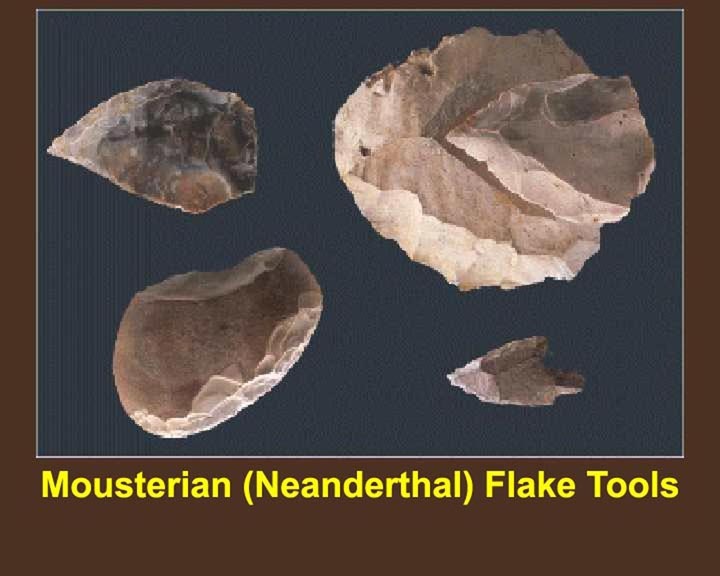 An "industry" defines characteristic tool types that were made by primitive human or pre-human species (human being defines, at least for now, as H. Sapiens Neanderthalis or H. Sapiens Sapiens). An "axe", by the way, is a tool that was used with a chopping motion. 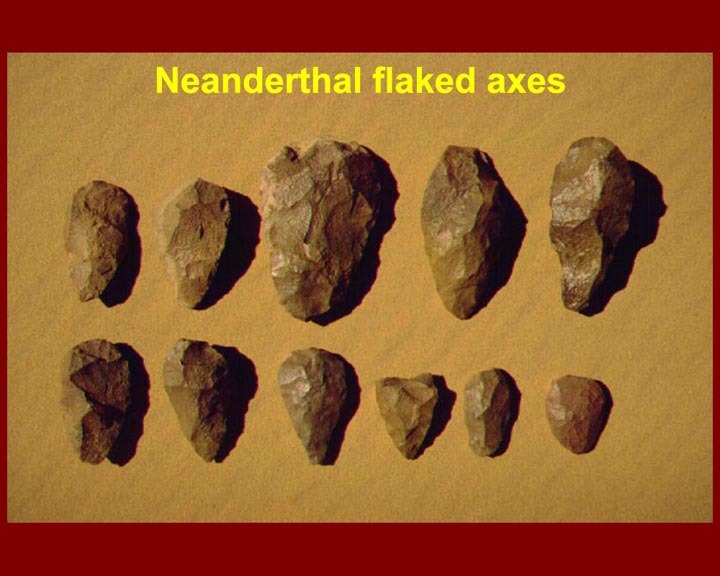 The two broad categories are hand axes and hafted (i.e., with a handle) axes. 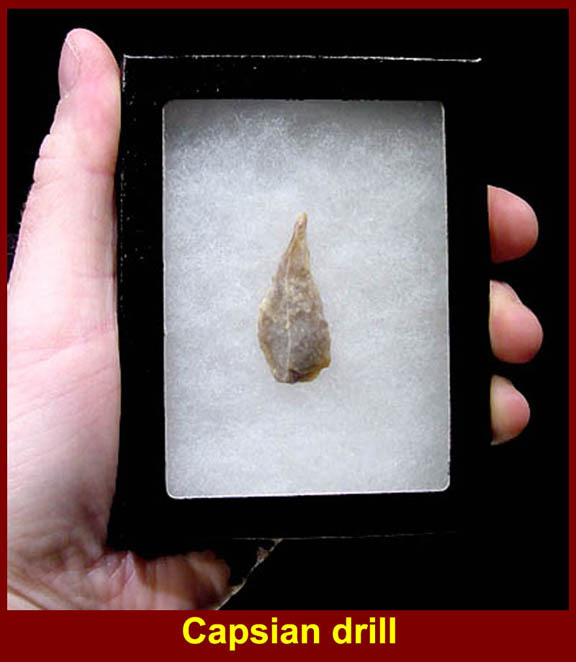 Mousterian tools are Paleolithic ("Old Stone Age") to Mesolithic ("Middle Stone Age"). 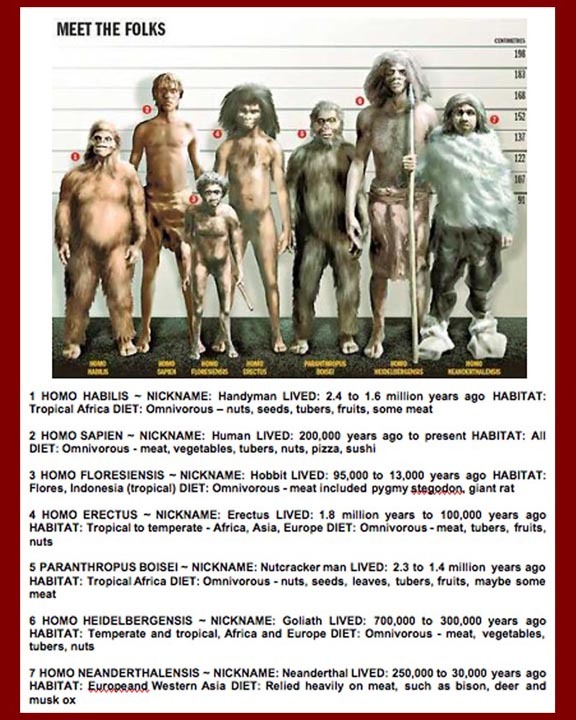 This and some of the following images are drawn from the Paleo Direct Internet site at http://www.paleodirect.com/primman1.htm. 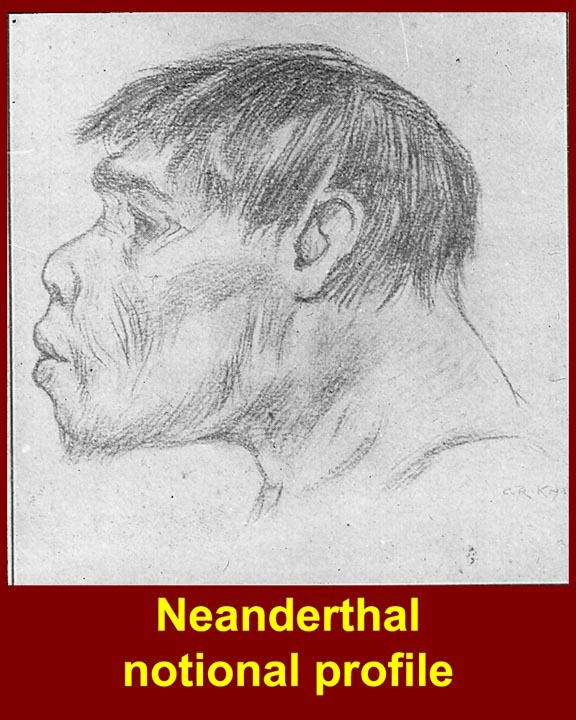 Drawing of the profile of a Neanderthal. "Aterian industry" tanged points. The "tang" is the part at the bottom of each point in this image and was used for binding to a haft (handle) which would be split on the end to accept the point. 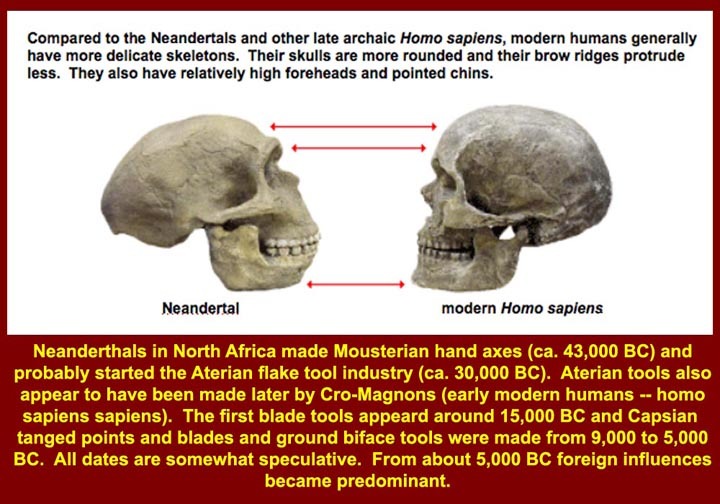 Aterian industry artifacts have been found at both Neanderthal and Cro Magnon sites in the Sahara. 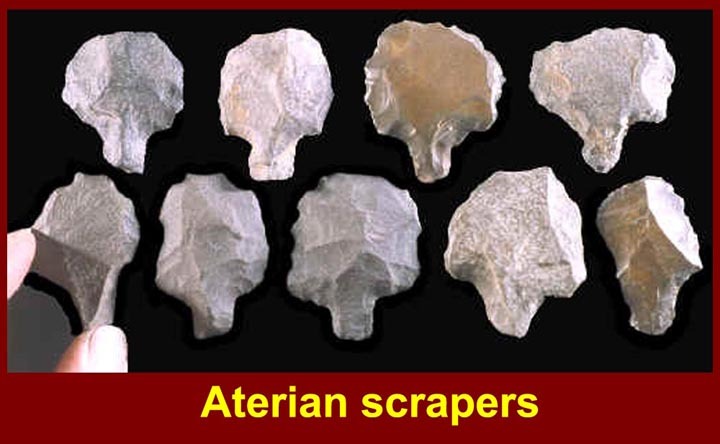 Aterian tools are Mesolithic and appeared about 35,000 years ago. 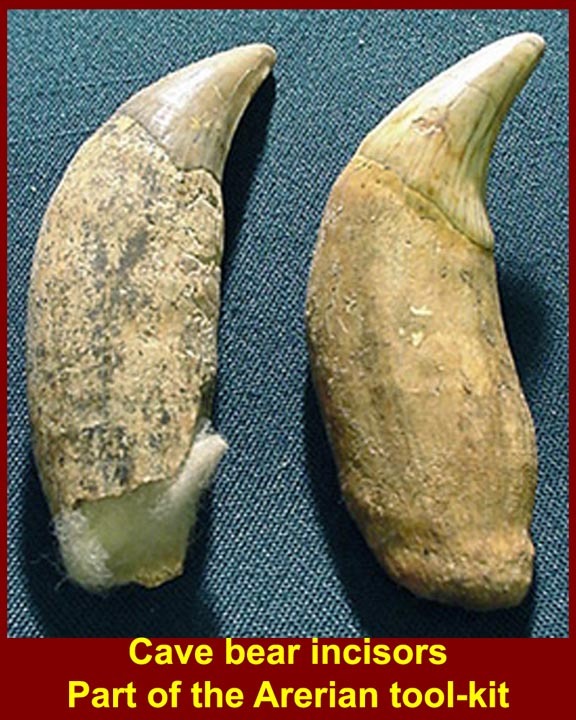 Bear claws found in "The Cave of the Bears" a North African Aterian site. 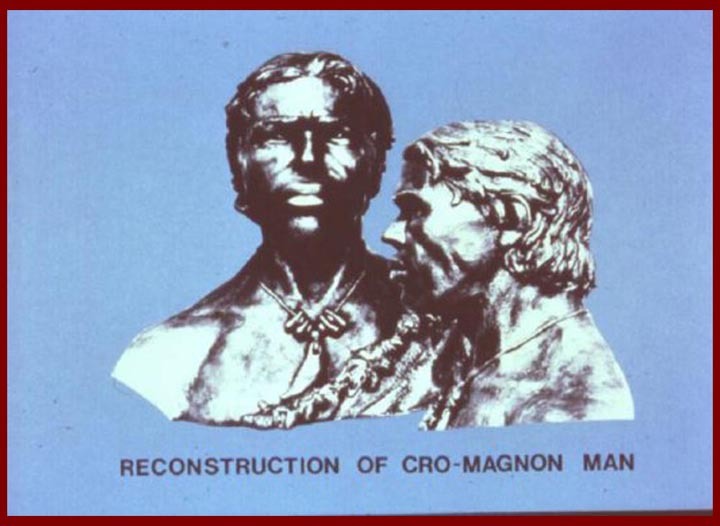 Drawings of Cro Magnons, the type of early modern man who made Aterian artifacts in common with North African Neanderthals. 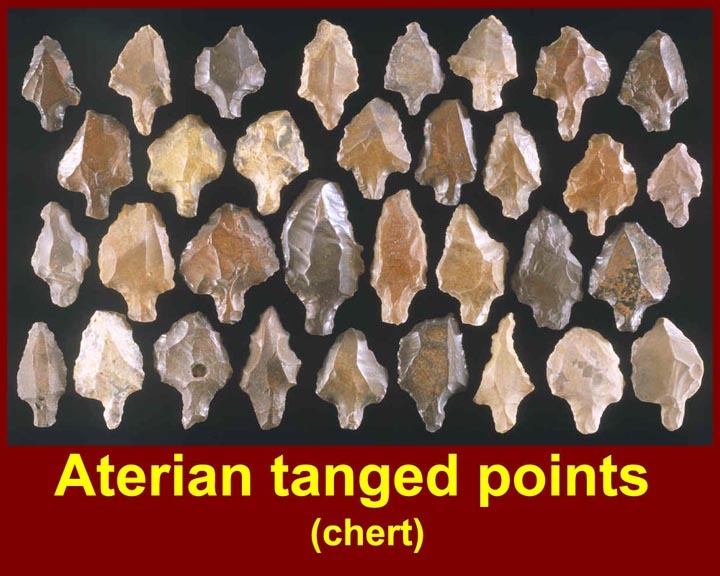 The Aterian tool makers were followed by a group of "Ibero-Maurusian" tool makers (also Cro Magnon type early modern humans). That name was used to describe North African tools that showed a supposed commonality of techniques between Iberian Peninsular and Mauritanian technicians -- with some proponents arguing for diffusion in each direction. Recent restudies of their tools shows more commonality with Egyptian techniques, but the Ibero Maurusian nomenclature is still used. The Ibero-Maurusian culture dates from about 18,000 years ago. 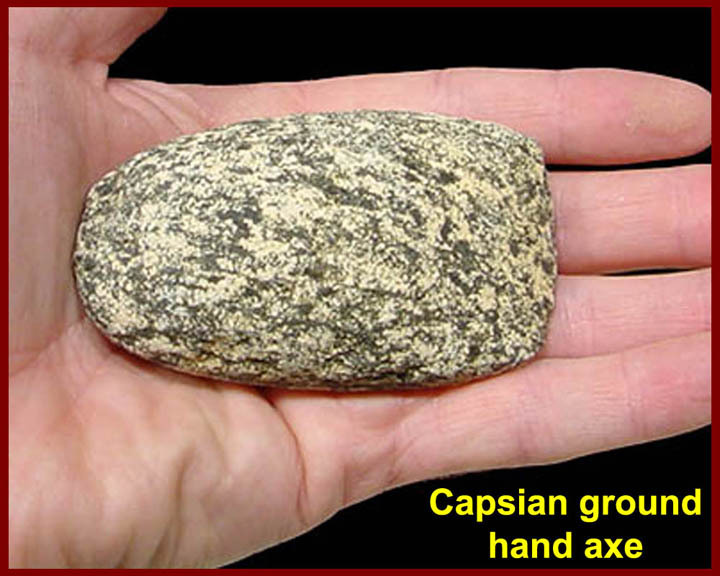 A Capsian hand axe. 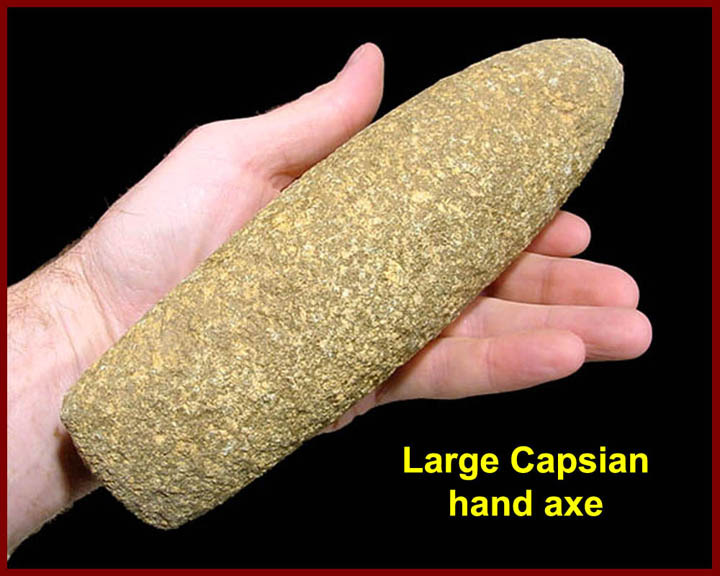 Capsian industry tools are definitely Neolithic ("New Stone Age") and date from 7,000 to 4,500 BC. The Neolithic Capsian period essentially ended with the arrival of Egyptian, Greek, and (later) Phoenician metallurgy. The initial findspot of Capsian tools was at Gafsa (ancient Capsa) in central Tunisia, just north of the Chotts. From this point onward, more artifacts are found closer to the coasts rather than in the interior, mirroring the time of the desiccation of the interior. This hand axe is ground rather than flaked (although initial flaking may have been used to "rough out" the implement before grinding). 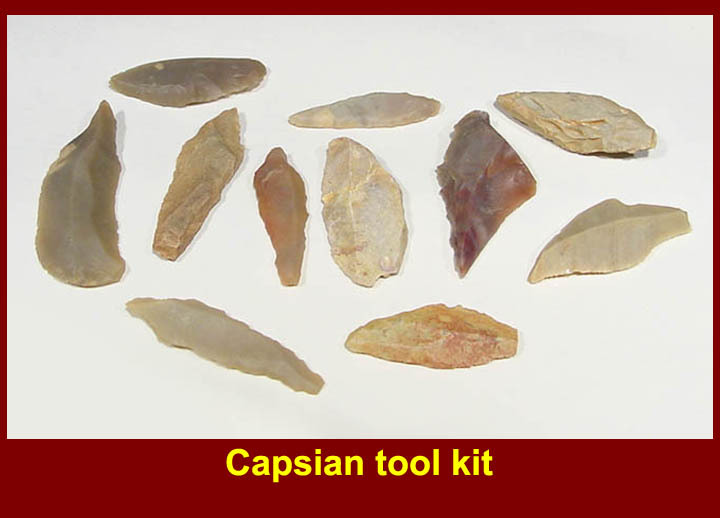 A Capsian "tool kit" (tools found in close association at a single site). Drills had much narrower profiles than projectile points. They were mounted on hafts or shafts and were spun by hand to drill holes in wood, horn, or bone. Querns were used to grind grain and usually are associated with cultivated (as opposed to gathered) grain. Ground grain, of course, implies some sophistication of diet. ("Stone ground" grain in primitive diets can also be deduced from tooth wear.) The illustration is somewhat deceptive: the handstone is smaller than normal for a quern of this size; it also is being held at a 90 degree angle from the way it would have been used, rolling along the long axis of the quern; and, finally, the way it is held in the illustration might imply that the handstone was scraped across the quern rather than being rolled along the quern's long axis. 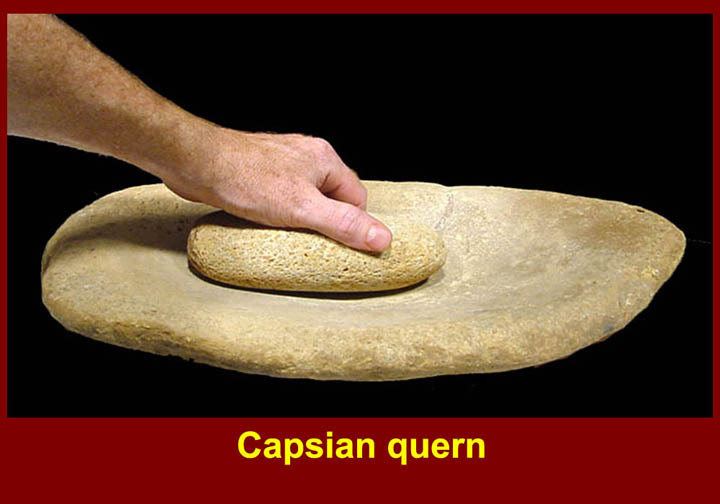 Querns are still used by "primitive" societies today, and study of their use indicates that flour can't be made unless the grain is at least slightly malted. The flour that is produces is usually either slightly moist or even pasty. 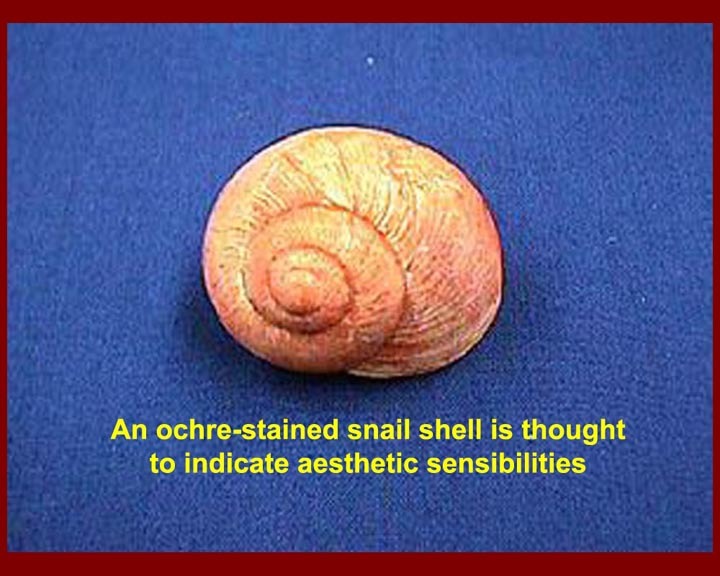 Large areas of land snail shells, up to a meter thick and as large as 200 meters square, are the result of sheet flooding typical of the Maghreb, covering Tunisia, Algeria and Morocco. The rammadiyat, as the shell mounds are known in Tunisian, consist of black to gray earth, ashes and stone mingled with shell material (seen in one of the examples below). They tend to be open-air sites and often contain graves. 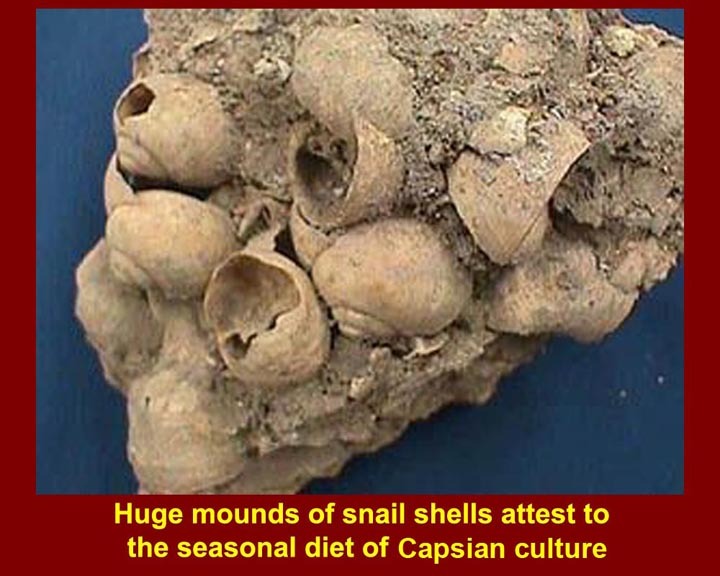 The mounds are usually barren of animal bones, but rich in implements. These sites date to the Capsian period, or about 7000 to 6500 BCE. 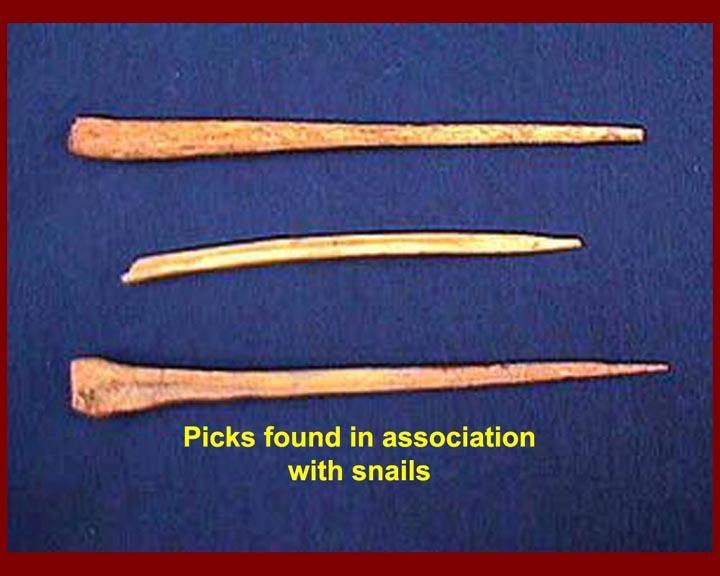 Picks found in snail shell assemblages. 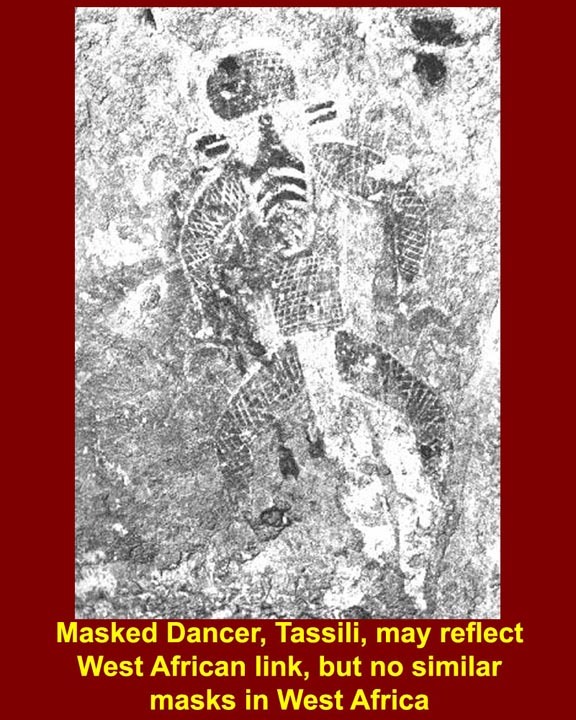 The Tassili N'Ajjer plateau in the Sahara is the most famous of the typically mountainous desert sites where Saharan rock art is preserved. 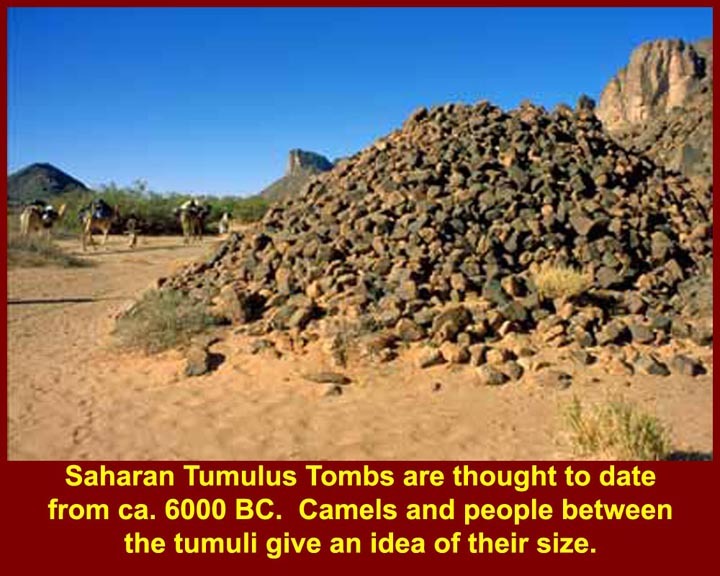 Saharan rock artists are thought to have been active from about 5500 BC until a few hundred years AD. There are several periods starting with the Bubalos, named after an early wild cow (Bubalus Anticus, much like a water bufalo), through the Cattle, Horse, and Camel periods. 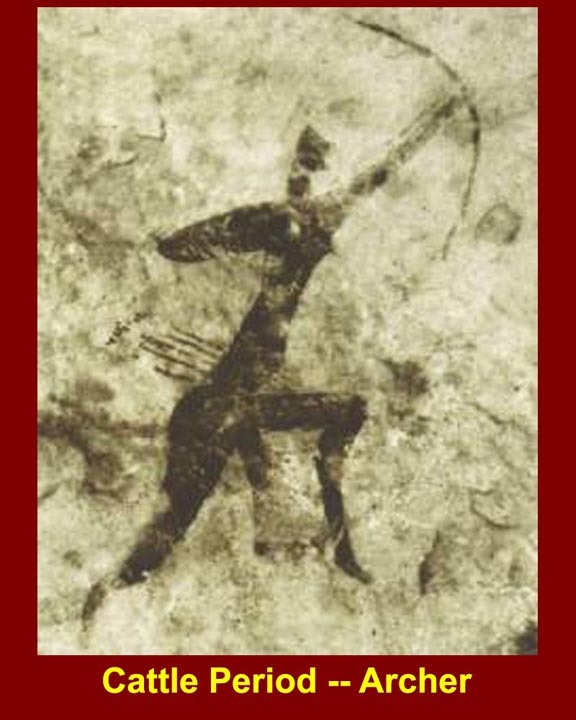 Bubalos period art shows hunting, the Cattle period shows herding, and the Horse and Camel periods include those animals. 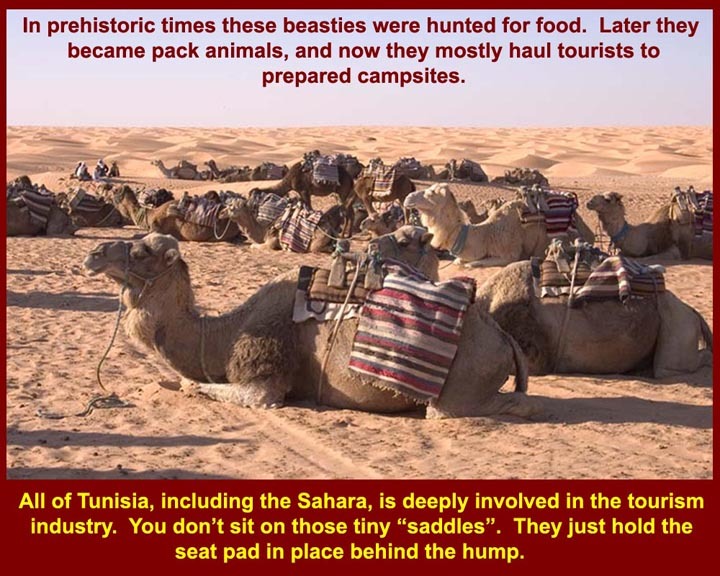 This gives a rough chronology starting with hunting, then herding on foot, then the introduction of the horse, and finally the arrival of the first camel introduced from further east around the beginning of the first millennium AD. 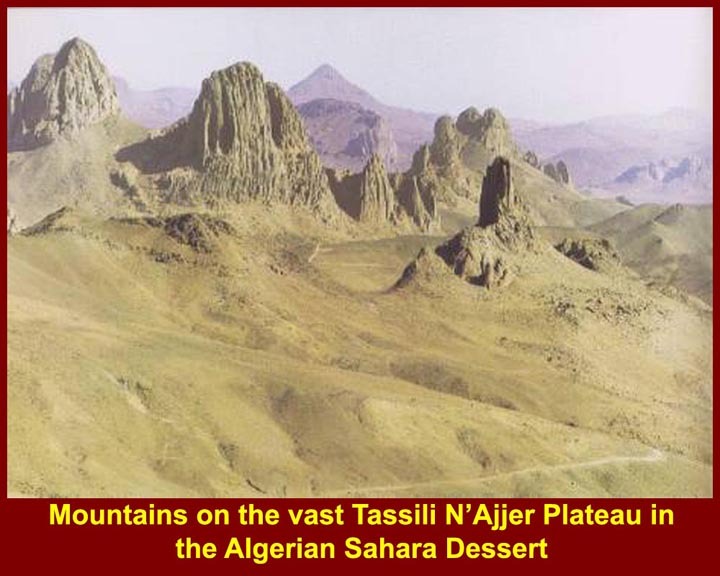 Mountains on the Tassili N'Ajjer plateau. At this and other Saharan sites, carved and painted images are preserved in caves and on open air exposed rock surfaces. 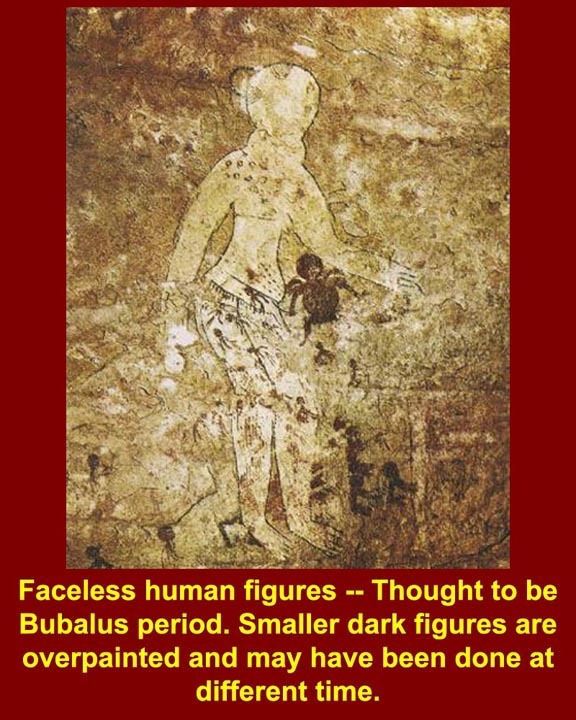 During the Bubalos period, people were often shown, but seldom with any features. Instead, a featureless round ball was shown. The style was also called "Roundhead" or aniconic. In this painting the darker figures were painted at some time after the larger white figure. The Bubalus period pre-dated 4500 BC. 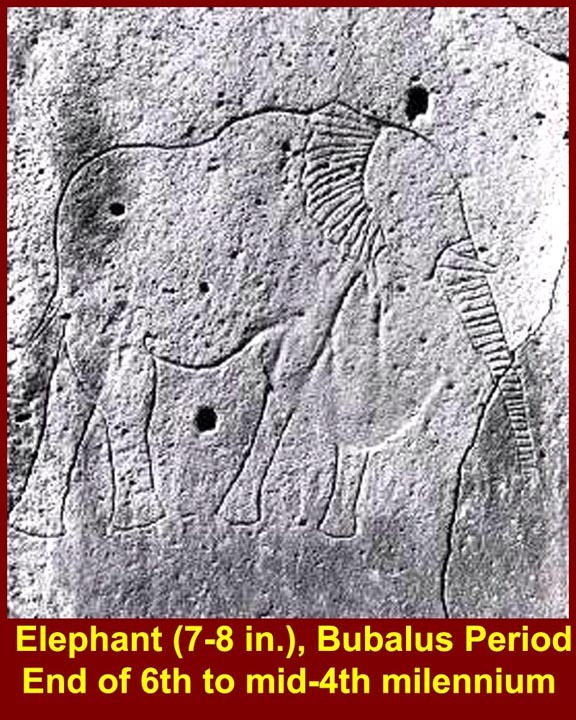 This image shows an inscribed elephant and dates from the Bubalus period. Other Bubalus period images show giraffes, hippopotami, bubalus cattle, and other large African fauna being hunted. The sites of these images are deep in the Sahara, but at the time they were painted the area had much more rain and appears to have been like the current African Savanna with, of course, pools for the hippos. 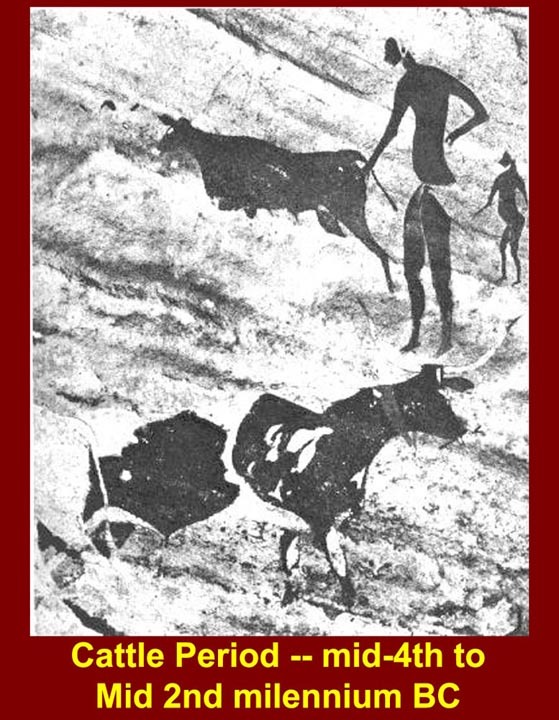 Cattle and men from the Cattle period which corresponds with the arrival of the first domesticated cattle -- about 4500 to 4000 BC. 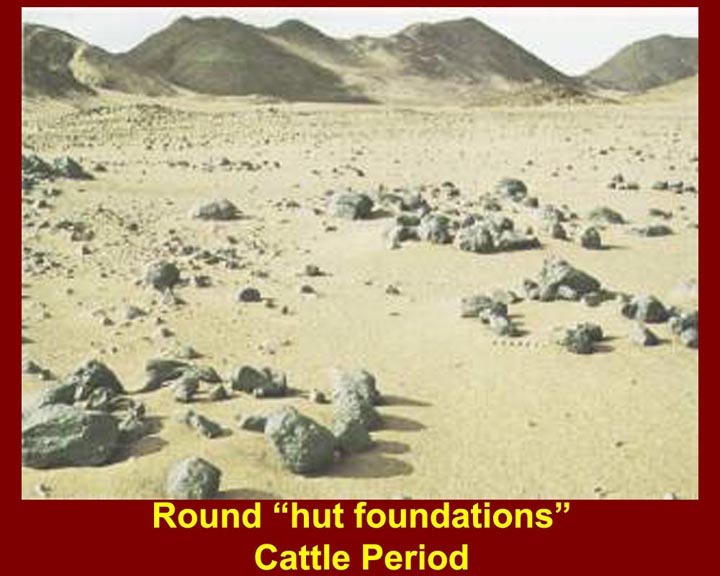 Although cave painting persisted into the Cattle and later periods, circles of stones, thought to be hut foundations also appear from the Cattle period onward. It i not definitively known whether either caves or huts were permanent accommodations, but it is assumed that the folks who made these pictures were nomadic pastoralist -- predecessors of the Saharan Bedouin. 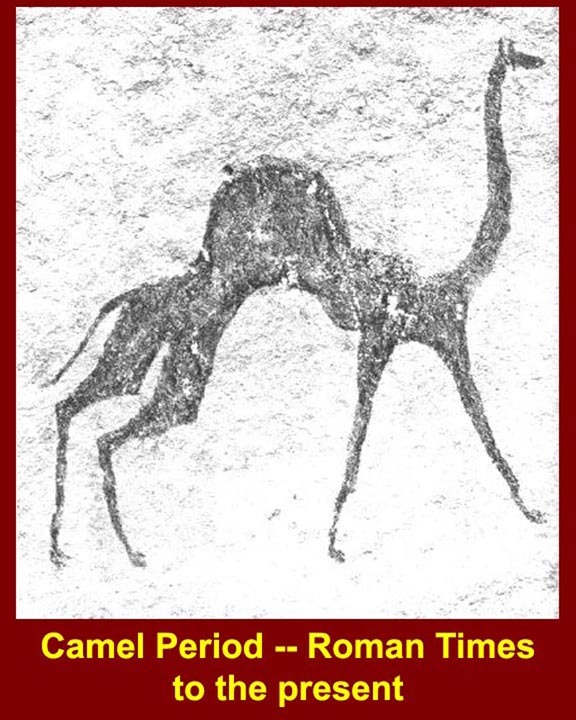 The Camel period, which started about the time of the Punic Wars, when camels were first introduced to north Africa, has none of the elegance of the Horse pictures. Or maybe we have only found the work of inferior artists. 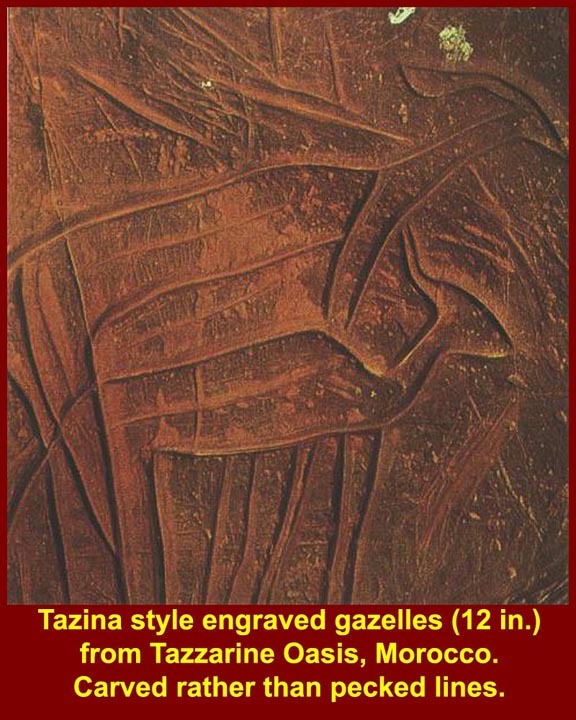 Incised gazelles from the Tazzarine Oasis in Morocco, carved (not pecked) in stone in the Tazina style (named after the first spot where such carvings were found). 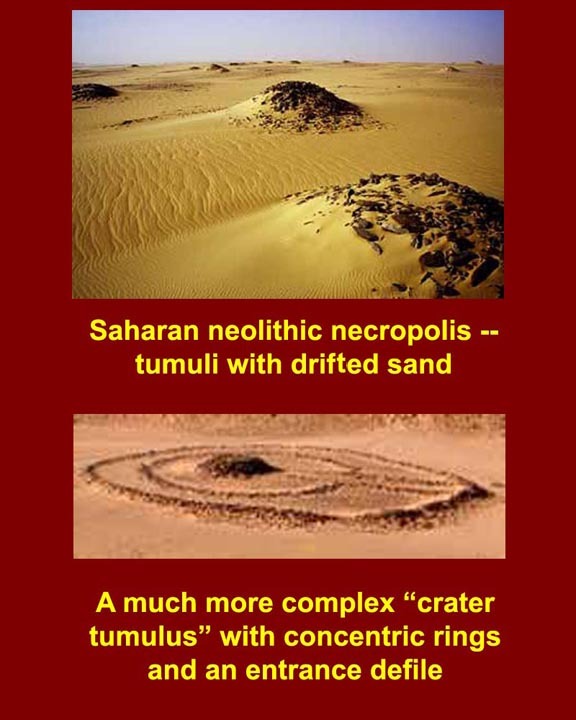 A multi-tomb necropolis in the dessert and a more complex "crater tomb" with concentric rings of stones and an entrance defile. It's unclear whether some crater tombs may be collapsed "chapel tombs", i.e., tombs with an internal chamber. 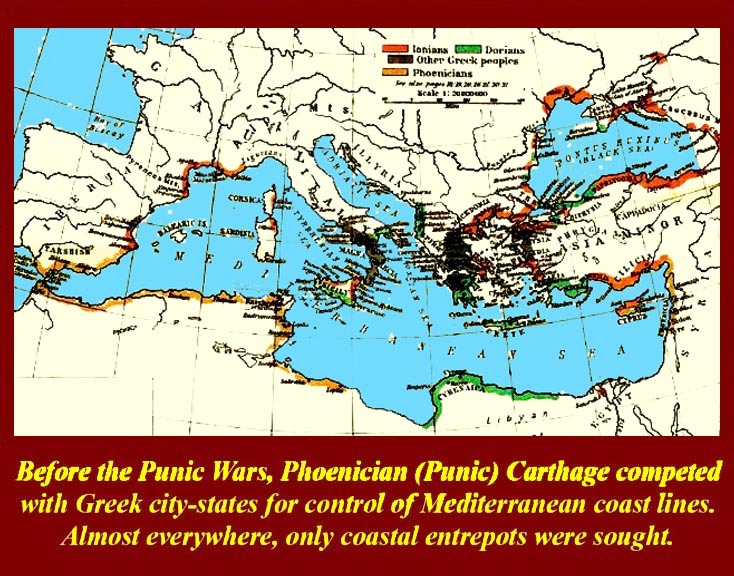 Most of what we know about the period of the Punic Wars comes from the history of the period written by Polybius. He was a Greek hostage (a former Greek General) who was quartered on Scipio Aemilianus (Scipio Africanus the Younger) who eventually destroyed Carthage. 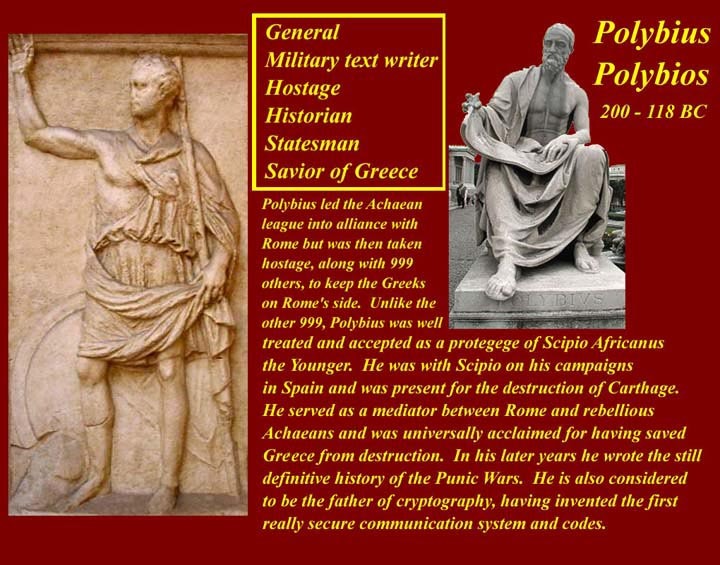 Polybius was present for the victories of Aemilianus in Spain and the at the destruction of Carthage and had access to the Scipio family archive which covered the victories of Scipio Africanus the Elder in the Second Punic war. 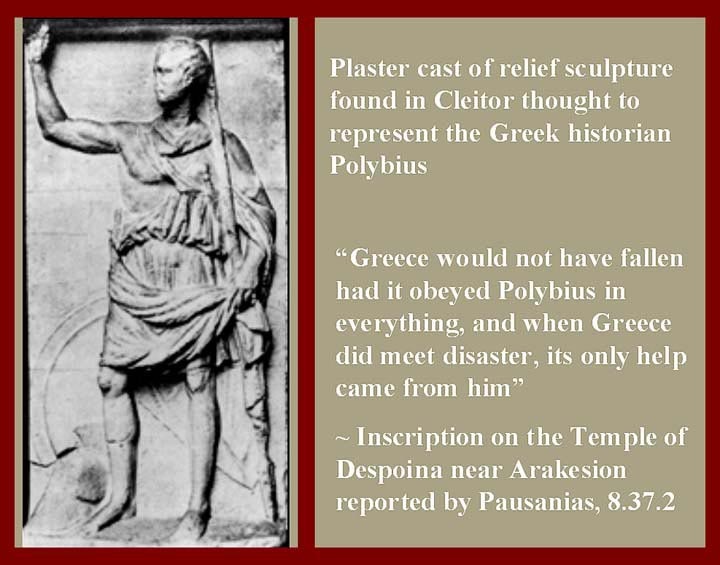 Polybius is still memorialized in Greece for having saved Greece from destruction by the Romans: he convinced the leaders of the Achaean League (led by Athens) to surrender rather than to fight. The upshot was that the Romans eventually glorified Greek culture and art rather than destroying it. More images of Polybius including a reference to him as the inventor of the torch/flag semaphore code system used for centuries by the Roman Army. It used five flags or torches to send messages and was based on what is still known among cryptographers as the Polybius Grid or Polybius Checkerboard, a five-by-five matrix that could represent all 24 letters of the Roman alphabet. The description of the Roman Republican government system (at the end of the Second Punic War) was rediscovered by Italian Renaissance humanists. It was translated into Latin (Polybius wrote in Greek) in the mid 15th century by Niccolo Perotti , who was in the employ of Pope Niccolas V (Thomaso Parentucelli), a patron of the humanists. It became an instant best-seller in the field of political theory and remained one for several centuries. The "greatness" part of Charles de Montesquieu's Considerations of the Causes of the Greatness of the Romans and Their Decline was based on Polybius. During the US Constitutional Convention, Jefferson sent multiple copies of the works of Montesquieu and Polybius to those assembled in Philadelphia. 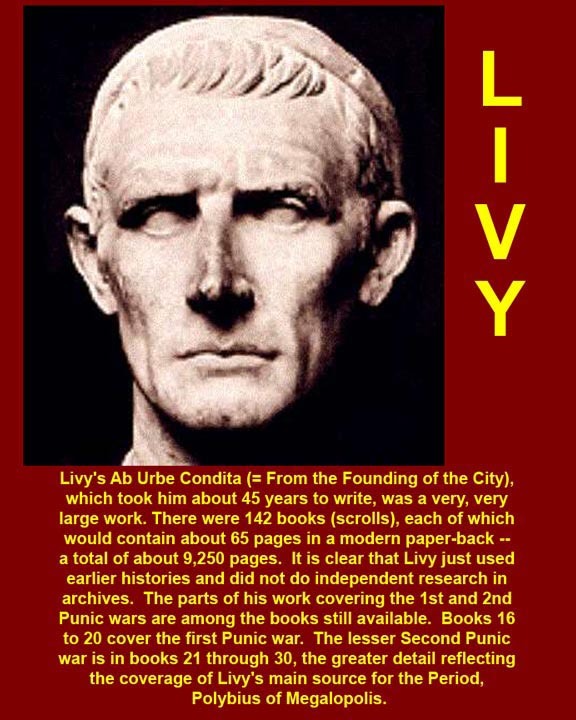 Titus Livius (Livy) is also sometimes called a "primary source" on the Punic Wars, but he was actually paraphrasing Polybius 150 years after the fact and during the reign of Augustus.